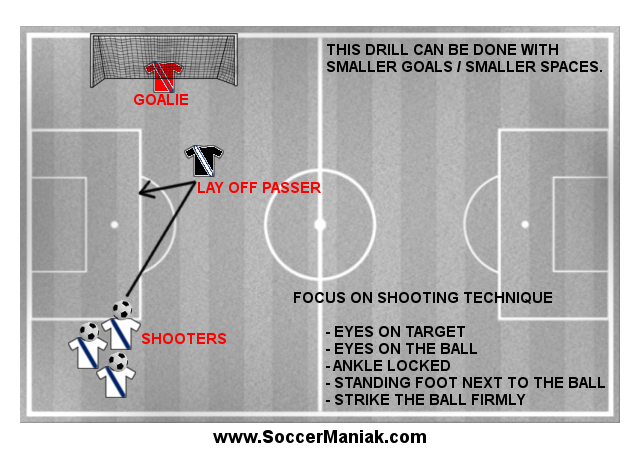 Improve soccer shooting skills with this soccer training drill. This soccer drill can be done by individual players wanting to improve their shooting and conditioning on their own or club teams where players can improve their skills without long waiting in line to shoot. Players should use the correct kicking technique when approaching to shoot the soccer ball. You can find more information on the soccer shooting technique by clicking. Players who want to develop and have a passion for the game should take training very seriously. Diet also plays a big part in players readiness but training at 100% develops the mentality to play games at the same 100% tempo. 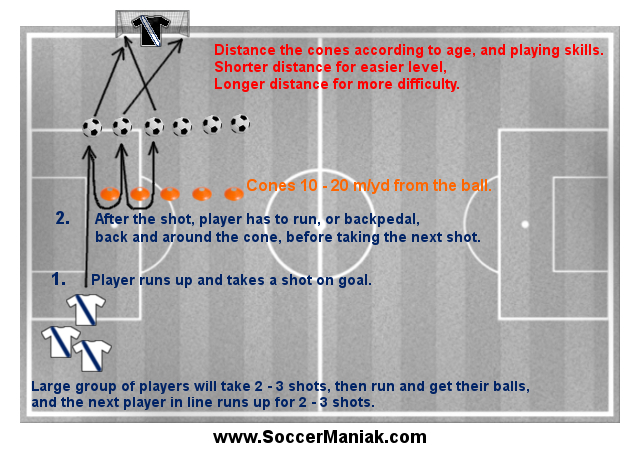 Place 2 cones, each cone at the edge of the penalty box, or 10 - 20 m/yd away from goal (depending on player age and skill level). Goalkeeper will take a place in goal, unless you are using small pug goals, than there is no need for a goalie. Split players into two groups, and position them on each side of the goal, behind the goal line. Split up the soccer balls, half on one side, half on the other side. Every player should have a ball. 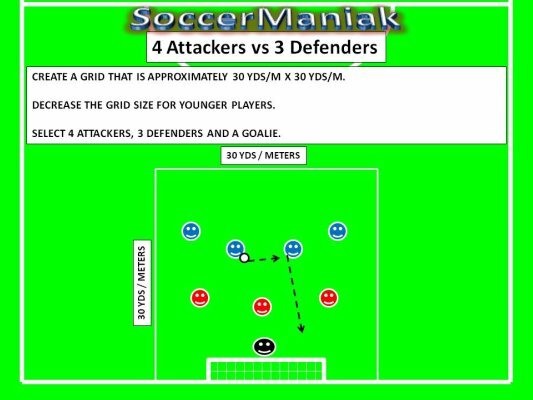 First player in line will dribble the soccer ball using short quick touches to the cone. 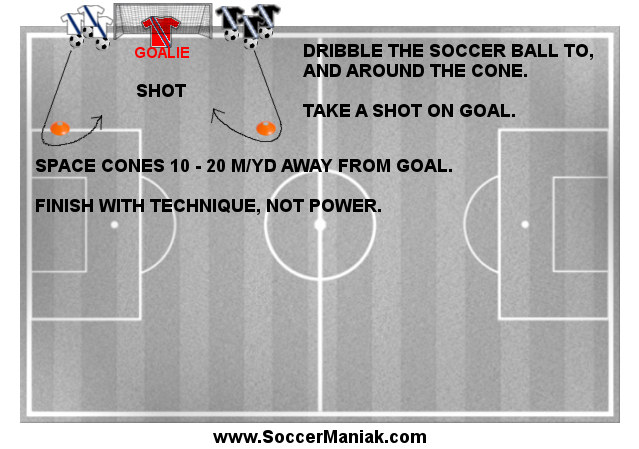 Player will turn around the cone and follow up with a shot on goal. Players will use their left, or right foot, depending on what side they started the drill on. Encourage players to attempt this shooting drill at a game like pace. Once the player takes the shot, he/she will go to the opposite side, and shoot with the opposite foot next. Limit kicks to Inside Shots, Outside Shots or Laces. Modify this drill with players having to do 5-10 knee highs, pushups, sit-ups, starting from laying position or on their belly or any other activity before dribbling the soccer ball. Instead of players dribbling the soccer ball, have them sprint up and around the cone with the player on the opposite side or the goalkeeper will serve the pass for a trap and shot, or one touch shot. There are many ways this drill can be incorporated in training. Get creative and work hard.